A rooftop cooling system tested positive for Legionnaires' disease, Mayor Bill de Blasio said during a press conference Thursday. The system was being decontaminated and no patients or workers within the hospital contracted the disease, according to officials. 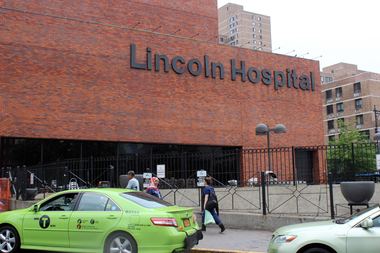 CIVIC CENTER — The number of New Yorkers sickened by Legionnaires' disease in The Bronx rose to 46, and rooftop air conditioning systems at both Lincoln Hospital and Concourse Plaza complex tested positive for the bacteria that causes the disease, Mayor Bill de Blasio said. The number of people killed by the disease remained at two, the mayor said. The city launched an investigation into the outbreak, which started on July 10, and has afflicted people in Highbridge, Morrisania, Hunts Point and Mott Haven. "We are aggressively investigating and testing all possible sources," the mayor said during a press conference at City Hall Thursday afternoon. The mayor added that the two cooling systems were already being decontaminated and that officials do not know of any patients or workers within the hospital or complex getting sick. "There is therefore no reason for alarm, the situation is being addressed," de Blasio said. The two people who died, a man and a woman, were both in their 50s and suffered from other ailments, including lung and heart disease, according New York City Health Commissioner Dr. Mary Bassett. The city's water supply remains perfectly safe, Bassett added, and New Yorkers should not be concerned about drinking tap water or using water fountains. The disease was most likely spread through mist from the two cooling towers to people outside the buildings, officials said. The city started testing cooling towers, plumbing systems and other systems that could have spread the disease, which cannot be contracted from person-to-person contact. Crystal Simmons, 50, was waiting outside of Lincoln Hospital for a ride Thursday afternoon. She said that she wasn't that nervous about the disease, provided that the hospital was taking care of it properly. "If I have an emergency, I'm going to come regardless," Simmons said. "I hope and pray that they take precautions." Frank Curet, 39, was waiting for his girlfriend, who works at the hospital. "Hopefully she won't get sick," Curet said. "I didn't really think it was that serious because usually when things come out like that, they always have it under control one way or another." The disease is caused by the bacteria Legionella, which grows in warm water and is often spread through plumbing systems like hot tubs, humidifiers and spas or cooling systems. People living in poverty are especially prone to getting the disease, especially in areas where there are higher rates of other serious ailments, according to Legionella Control International, an international organization that works to prevent the disease. "Underlying medical conditions are a significant risk factor when it comes to Legionnaires’ Disease, with the vast majority of those people infected by the bug having at least one health condition such as heart disease or diabetes," the organization said in a statement. The cooling system at Co-op City was found to have the bacteria in January, according to the Health Department. At that time there were 12 diagnosed cases of the disease. New Yorkers who have symptoms including chills, muscle aches, fever and a cough are advised to seek medical attention. "It’s very important if anyone has a concern that we hear something about that," de Blasio said.